They powerful Chinese emperor Haung Di is one of the Five Emperors of China and a mythological ancestor of the Chinese people. Many believe that Huang Di controlled the lighting and thunder. One thing is sure, in Huang Di The Yellow Emperor slot by Microgaming, this legendary character will control your fortunes! 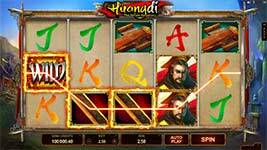 Play this 5-reel 25-line slot today and discover the ancient treasure that await! The powerful Chinese emperor Huang Di is one of the Five Emperors of China and a mythological ancestor of the Chinese people. Many believe that Huang Di controlled the lighting and thunder. One thing is sure, in Huang Di The Yellow Emperor slot by Microgaming, this legendary character will control your fortunes! Play this 5-reel 25-line slot today and discover the ancient treasure that await! Microgaming has spared no expense in creating a visually appealing game with great bonus features. Emperor Huang Di appears on the reels as an expanding wild symbol in the base game while a golden dragon acts at the scatter. The game logo also appears as a normal wild in the game while weaponry and treasure chests fill out the symbols. There is a subtle soundtrack to this game that begs for you to hit a bonus feature. When you do, the music picks up in tempo and your game play intensifies where you can win up to 300,000 coins! Expanding Symbols – Any full symbol stack on reel one will expand all matching high symbols on the remaining reels in the base game. During free spins any full symbol stack on reel 1 expands all matching high symbols and Wilds on the remaining reels. Huang Di Wilds – The Huang Di game logo is the wild symbol and substitutes for all symbols except the Golden Dragon scatter to complete wins. Free Spins Feature – To trigger free spins land 3 or more Golden Dragon symbols anywhere on the reels. You will earn 15 free games with the wild symbol stacked on the entire first reel of the game! On top of that, free spins can be re-triggered to give you incredible chances for big wins.